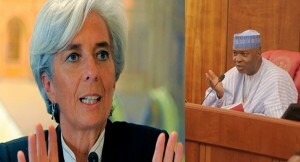 The Managing Director of the International Monetary Fund (IMF) Christine Lagarde on Wednesday met with leaders of the National Assembly and called for the removal of fuel subsidy. Speaking during a meeting with some lawmakers from both the lower and upper legislative chambers, she also called for a review of Nigeria’s tax regime. Although the lawmakers are currently on recess, the Senate President, Bukola Saraki and some lawmakers from the two Chambers of the National Assembly were on ground to receive the IMF boss. The Chairmen of the Senate Committee on Finance, Senator John Eno and that of Appropriation, Senator Danjuma Goje were also at the meeting. The Senate President told the IMF boss that Nigeria is experiencing challenging times due to low oil prices and insurgency in the Northeast. He, however, said Nigeria is resilient and would surmount these challenges. Senator Saraki further noted that the National Assembly has a key role to play in ensuring that the government’s policies are sustainable. In another meeting with the Central Bank Governor, Ms Largade called for increased funding for the nation’s real sector. The former French finance minister, who spoke with journalists after the meeting expressed optimism that increased funding of the critical sectors of the economy, such as agriculture and the Small and Medium Enterprise, remain key to the nation’s development. She expressed confidence in the Nigerian economy but says she expects more stability in the system. “Nigeria faces some tough choices going forward. Nigerians, however, are well known for their resilience and strong belief in their ability to improve their nation and lead others by example. “I firmly believe that Nigeria will rise to the challenge and make the decisions that will propel the country to greater prosperity”, she said. The Central Bank Governor promised to fashion out modalities in getting the commercial banks to work in that direction. Ms Lagarde also visited the Mother Theresa Orphanage in Gwarinpa Area of the Nation’s capital and advised the government to invest in its younger generation. The IMF boss donated N1.5 million to the orphanage to improve the lives of the children.